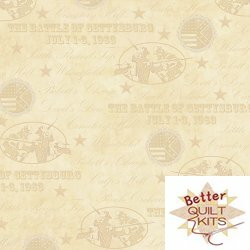 Gettysburg-22760E Cream Medallions [22760E] - $10.25 : Better Quilt Kits, Helping you make Better Quilts! 1863 - 2013 - 150th Anniversary. With the Gettysburg collection you can make a piece of history. Features historical images, the Gettysburg Address, President Lincoln, General Meade and General Lee. Ships April 2013.